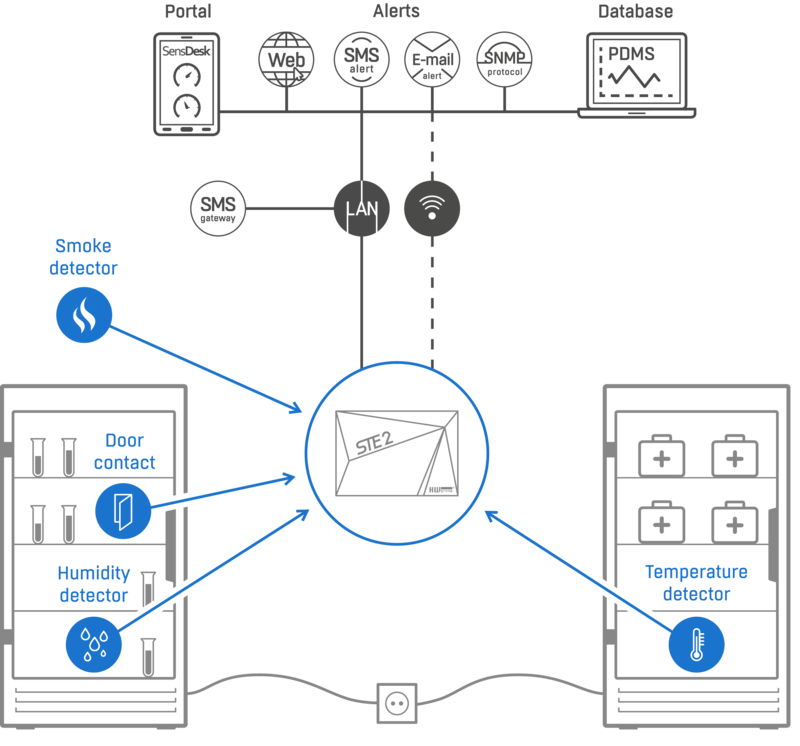 Solution describes temperature monitoring in refrigerators and storages where pharmaceuticals and temperature-sensitive items are kept. Hospitals are required to adhere to prescribed standards and regulations. To do that, they must ensure temperature monitoring in refrigerators and storages where pharmaceuticals and temperature-sensitive items are kept. Hiring staff to check individual refrigerators and storages is expensive and also unreliable. The problem calls for a suitable and reliable monitoring device. A good idea is to use our solution based on a LAN, WiFi or GPRS network. The STE2 unit is used to solve the problem. 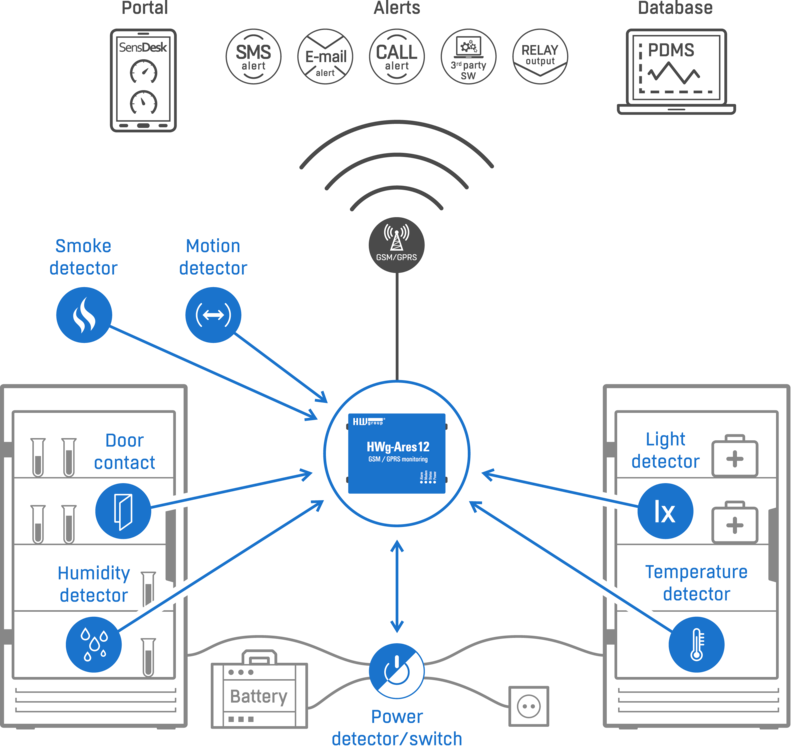 The unit continuously monitors the temperature using up to 3 sensors. As soon as the temperature leaves a specified range, a notification is sent by e-mail or a text message. If necessary, the unit can also inform when the storage door is opened. 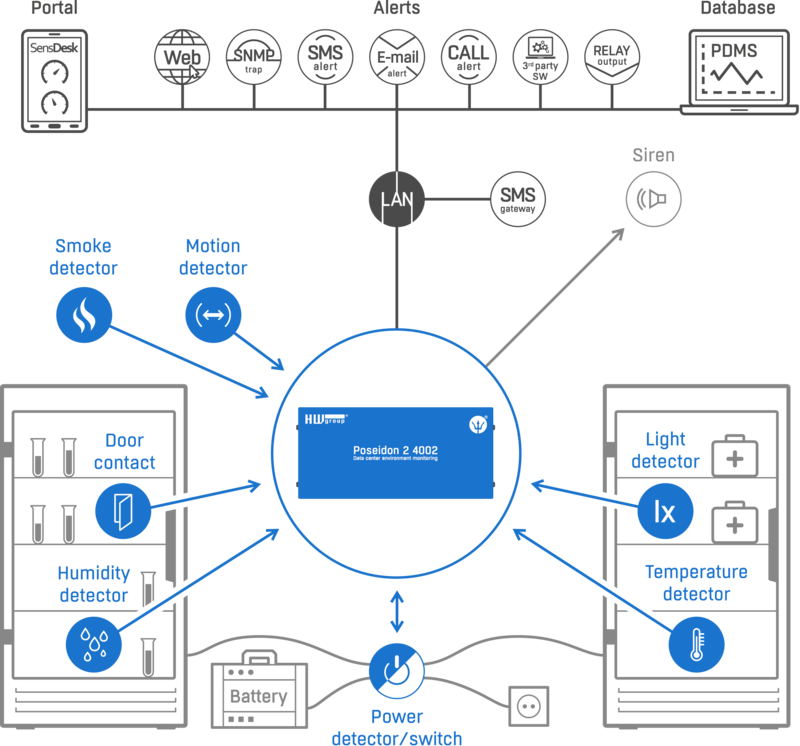 A monitoring unit of our Poseidon2 series is used to solve the problem. The unit continuously monitors the temperature. As soon as the temperature leaves a specified range, a notification is sent by e-mail, a text message, or another alarm method. In addition, data are recorded in the unit, or directly in an Excel sheet, for easy overview. If necessary, the unit can also inform when the storage door is opened. With the HWg-Ares14 unit, you can use all the advantages of the SensDesk portal and the Poseidon2 extensibility even without a computer network. The Ares unit continuously monitors the temperature. As soon as the temperature leaves a specified range, a notification is sent by e-mail or a text message. The unit can also inform when the storage door is opened. In addition, the unit keeps working even during power outages and informs about the power problem. It will also send an alert if the temperature rises above the specified threshold due to the power failure.